The numerous rivers, valleys, and hills common to Western Pennsylvania divide Pittsburgh into many neighborhoods. Pittsburgh Seminary is located between two such neighborhoods. Pittsburgh Seminary is located between two neighborhoods. To the north is a residential area of substantial homes, Highland Park, which takes its name from the large city park less than one mile from the Seminary. As one of Pittsburgh’s finest, Highland Park offers woods, picnic areas, paths for biking and walking, and tennis courts. To the south is the downtown area of East Liberty, a business and residential district undergoing substantial renewal. In the last 15 years, East Liberty has become home to new shops, numerous hotels and a community theater, and a number of restaurants and bakeries. Within walking distance are American, Tex-Mex, French-Canadian, barbeque, Japanese, and Thai cuisine. A converted Nabisco bakery has landed Google as an anchor tenant. The surrounding population represents a healthy racial and ethnic cross-section of urban America. In the past few years, The Economist Intelligence Unit, Forbes.com, and Places Rated Almanac have all ranked Pittsburgh at the top of their most livable cities lists. National Geographic Traveler named the ‘Burgh among the best places in the world to experience in 2012. Called one of the world's "prettiest" cities by The Huffington Post, Pittsburgh is arguably the only city with an entrance—the Fort Pitt Tunnel, coming north out of which the city fairly explodes into a dramatic visual presentation. Pittsburgh offers much to enrich one’s theological education. Through volunteer opportunities and field education, there are many opportunities for students to experience the richness of the region. Within a short drive of the campus, students can serve as pastors in inner-city, suburban, small-town, rural, traditional, and emergent churches; as chaplains in hospitals, hospices, and penal institutions; as campus ministers at some of the 10 area colleges, universities, and graduate schools; and in many forms of social outreach. In addition to education, this region offers a quality of life not found in many places of its size. Urban renewal in the city has included a commitment to the arts and education. An internationally acclaimed symphony orchestra, along with resident opera, ballet, and theater companies, perform regularly in city theaters. Pittsburgh is also the home of several exceptional art collections and museums, including the Andy Warhol and Carnegie museums. Sports enthusiasts are delighted to cheer for the Pittsburgh Steelers (football), Pirates (baseball), and Penguins (hockey). The city is home to world-class health care, the leading employer in the region, and top-ranked institutions which provide a rich atmosphere for intellectual growth. The 'Burgh is bursting with activity. All these factors make the region a stimulating place in which to live, study, and serve. The wealth of educational and employment options also make Pittsburgh a wonderful location for spouses and family members seeking opportunities close to the Seminary’s campus. The City of Pittsburgh is the scene of Western Pennsylvania's largest and most important educational complex. Pittsburgh Theological Seminary is associated through the Pittsburgh Council on Higher Education, which includes Chatham University, Carnegie Mellon University, University of Pittsburgh, Carlow University, Duquesne University, Robert Morris University, Point Park University, and Community College of Allegheny County. The cluster of educational institutions in Pittsburgh provides an atmosphere of intellectual growth. 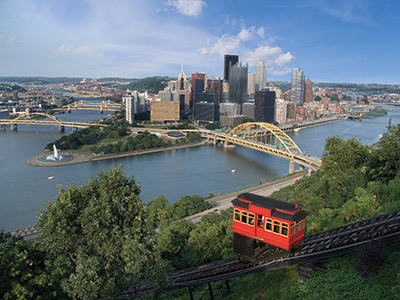 Learn more about Pittsburgh and the many things to do and see in the city. Also, check out Pittsburgh Magazine. Location: Pittsburgh is within 500 miles of more than half of the U.S. population, and the city is less than 90 minutes flying time from 20 states and Canada. Port: Pittsburgh is the nation's largest inland port, providing access to the extensive 9,000 mile U.S. inland waterway system. Bridges: Allegheny County has more than 1,700 bridges, 720 within city limits, and 15 major bridges crossing downtown Pittsburgh alone.